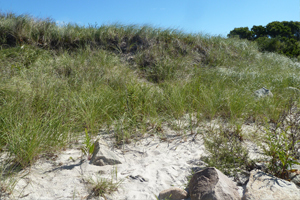 The third workshop of a three part series was held on September 15th, 2016 at Harkness Memorial Sate Park Waterford, CT.
You are invited to participate in a Living Shoreline Design Charrette at Harkness Memorial State Park. Teams made up of workshop participants will design a living shoreline for the on-site beach/dune, bluff or tidal wetland system. The designs will be presented and critiqued from a regulatory perspective by a panel of municipal, state and federal officials. The goal of this charrette is for participants to gain a better understanding of living shoreline designs and what will and will not be permitted in Connecticut. The second workshop of a three part series was held on June 24th, 2015 at Avery Point campus in Groton, CT. The 2nd in a series of workshops, Living Shorelines II focused on an integrated approach to living shorelines and review examples of living shorelines installations in CT and other states. 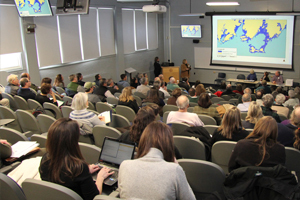 The First workshop of a three part series was held on January 9th, 2015 at Avery Point campus in Groton, CT.
How are they important to Connecticut? 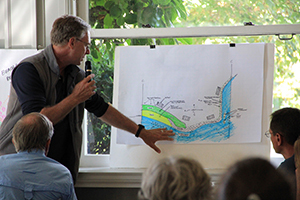 What is the process for permitting living shorelines? This UConn Climate Adaptation Academy workshop highlighted road flooding. We focused on projected road flooding with sea level rise along with concurrent impacts to tidal wetlands and marsh migration. We then explored various approaches to identifying and prioritizing road flooding issues including consideration of environmental and natural resource impacts, basic engineering concerns, local “political” issues, applicable regulations at both the state and federal levels, and legal options and concerns for municipalities. READ MORE about the workshop. Building on the foundations from the Legal Issues in the Age of Climate Adaptation workshop held in November 2015 and the participants’ questions it generated, we present 4 fact sheets that address many of these questions. The afternoon session delves into two major climate adaptation issues with numerous legal ramifications: elevating structures and resilience of roadways. The first in a 3 part series of workshops exploring how sea level rise and climate adaptation efforts may be addressed through legal concepts like the Public Trust Doctrine and regulatory processes like permitting and how climate adaptation may change how we look at those concepts and processes. Environment Chairman Rep. James Albis provided opening remarks.